Ahhh, what a weekend it was! My girlfriends headed back home yesterday afternoon and I truly felt like I was about to cry. We had the best time, as is always the case. We had the house all to ourselves -- Ian left Friday for the mountains with some guy friends. We could just be extra loud and giggly and girly as we wanted! As soon as the girls got in Friday, we poured some fun blueberry-cucumber cocktails that I'll be sharing the recipe for soon. This was easily one of my favorite cocktails I've made all summer. We had appetizers for dinner and just snacked and chatted until it was way past our bedtime. 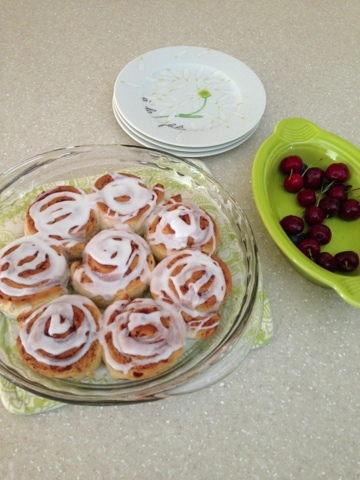 The next morning, I put out some cinnamon rolls and fruit before we headed to Freedom Park to take a walk. 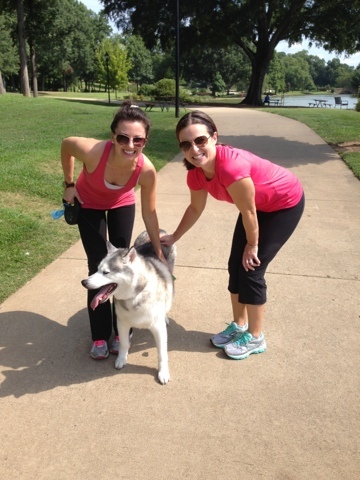 It was so warm out, but we always feel better if we do something active. It justifies the champagne. 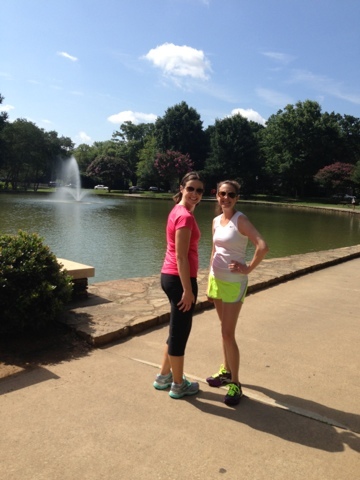 We walked for a mile and a half before surrendering to the heat and calling it quits! 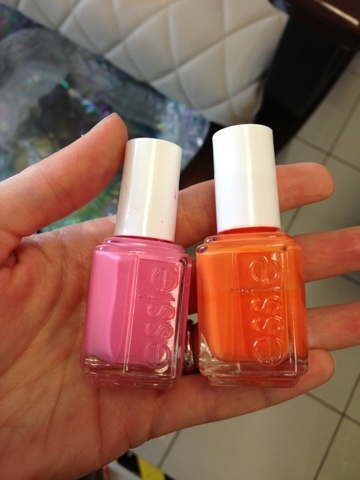 We'd planned a bit of shopping for that afternoon ... we hit up Monkees, Vestique, and Petal and then topped off the day with manicures and pedicures at Polished. I just love this place ... not only is it decorated so swanky, but they serve you drinks while you get gussied up! When it was time to get ready for dinner, we all got ready in the same room. What's better than doing your makeup with your girls by your side?! We sprawled out our makeup on the dresser and beautified together. Dinner reservations were at 7:00 that night at 5Church in uptown Charlotte, so we parked the car and took the lightrail into the city center and then just walked to the restaurant. I thought 5Church was delicious! 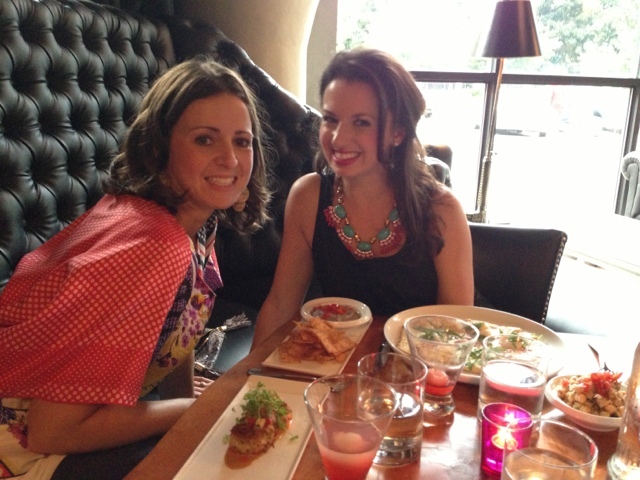 We absolutely loved the atmosphere and menu. The 5Church martini was right up my alley -- vanilla vodka, lychee juice, ginger ale, and fresh lychees. Good gracious, it was tasty. 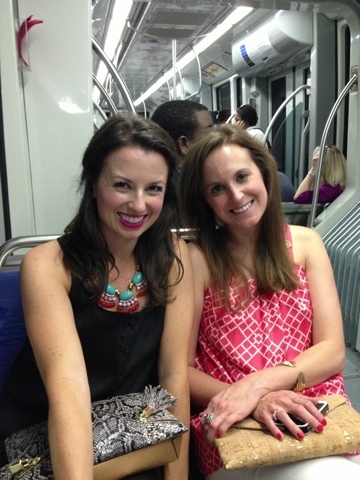 On the way back to the lightrail after dinner, we decided that the night was too fun to come to an end. We went to the Epicenter and checked out Bubble Lounge, a new champagne bar. 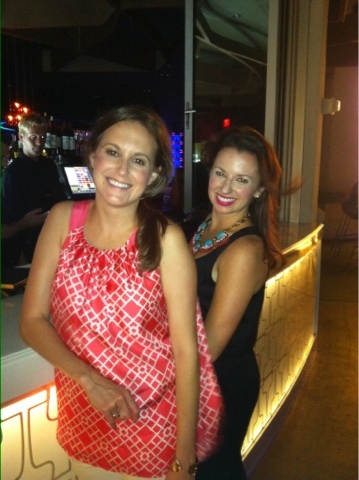 I loved wearing my new Loft Racerback Jumpsuit ... a little step out of the comfort zone, but it was so fun! I paired it with BCBGeneration rose gold heels, my new ILY Couture necklace, and an Asos tassel clutch (gift from my sister). 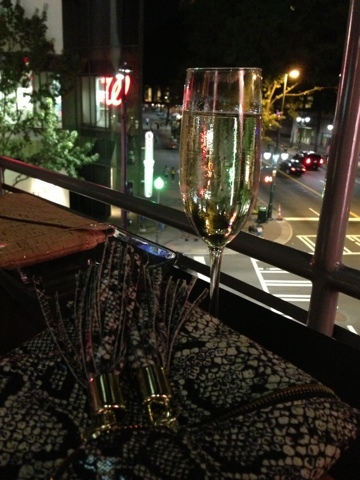 This champagne bar was so much fun and we nabbed the perfect seat on the patio overlooking uptown Charlotte. We got champagne with St. Germaine ... a favorite combo. 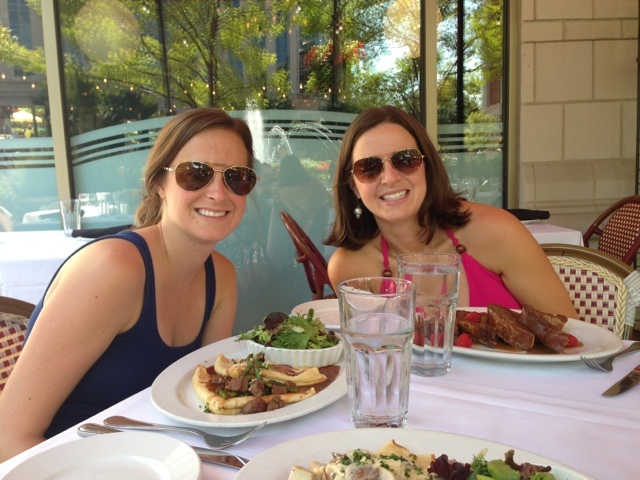 Sunday we enjoyed a French brunch at Georges Brasserie. I'm still dreaming of those chicken and mushroom crepes! Oooh la la, they were magnifique. As sad as I was to see the girls leave, I'm even more excited to plan the next get-together. There really is nothing like great girlfriends who lift you up, support you, keep you laughing, call you out, hug you hard, and tell you they love you! I loved seeing your instagram photos of your weekend! It sounded like you girls had the BEST time! AAAH! This post made me so jealous! I miss living in Charlotte so much! 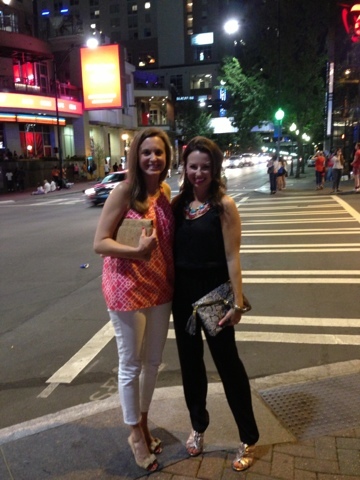 There is no better city for a girls weekend! That looks so fun!!! Glad y'all had such a big time! Girl weekends are the best! I wish more of my close gals lived closer to me. I love the idea of a champs bar. Yum! I love the jumpsuit on you!! It looks like you girls had such a fantastic time. That nail salon is easily one of the nicest I've ever seen! 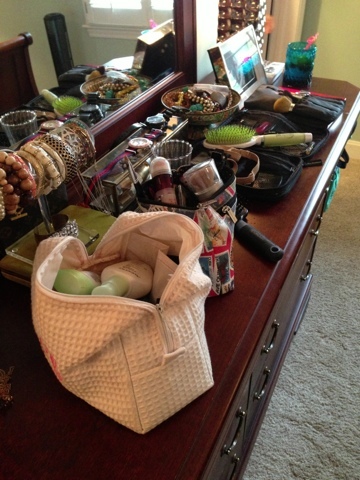 Also - one of my favorite parts of girls weekends is getting ready in the same room. Such a college throwback! Yes, the 5Church lychee martini is delicious! I'm going to a happy hour at Bubble on Wednesday, I'm glad to read that it was fun, I'd heard some mixed reviews, but sounds like maybe they've worked out some of their kinks since opening. This looked like so much fun !! I love your necklaces in these pics ! And wow I wish I could pull off that bright pink lipstick I love it its perfect for a night out with your girlfriends ! I don't think my hubby would appreciate it lol !! I'm due for a girl's weekend! Having one in October! Can't wait! Love me some fizzy flowers too! I order it when out on the town now! That sounds like an absolutely wonderful weekend! Girl time is the best and much needed for the soul! I love to see where people take their in town guests! Polished, 5Church, Bubble?! I love your entire agenda! So fun! 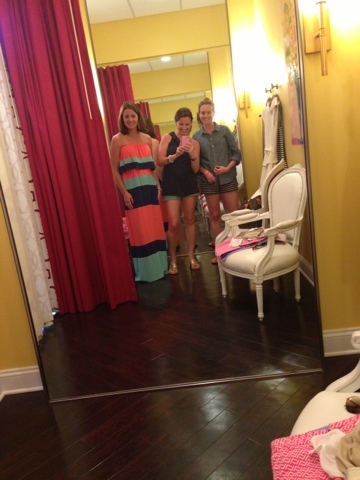 And getting ready together takes me back to my sorority days. Sigh. Okay - ready for your blueberry cocktail recipe!!!! Aww, what a great weekend! 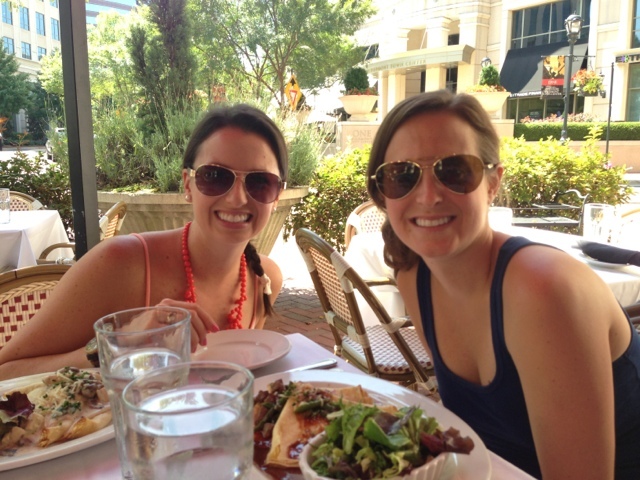 It sounds like you did lots of fun things, had a wonderful time with your girls, and ate some delicious food! looks like so much fun! my girlfriend is visiting next week and I cant wait! What a fab weekend! Love the jumpsuit and the necklace! I've been doing a little St. Germaine in a vodka soda lately, refreshing. What an amazing weekend! I love hearing all the neat places to go visit in Charlotte. I am marking down 5Church and Bubbly to try next time we are in town! The 5Church martini sounds amazing. My favorite weekends are ones spent with good friends. What a FUN trip!! Can't wait for your blueberry-cucumber cocktail recipe! Yum, yum, and yum!! 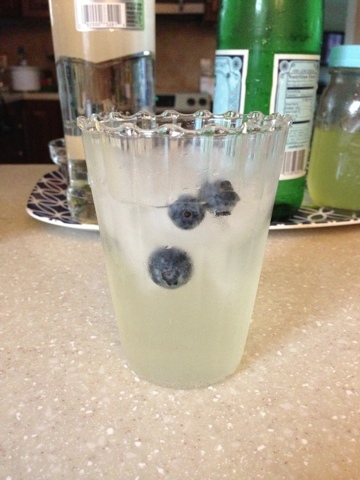 Also, that blueberry-cucumber cocktail needs to make an appearance in my kitchen ASAP! Looks like such a fun weekend! From the cocktails to the friends, what a perfect experience. 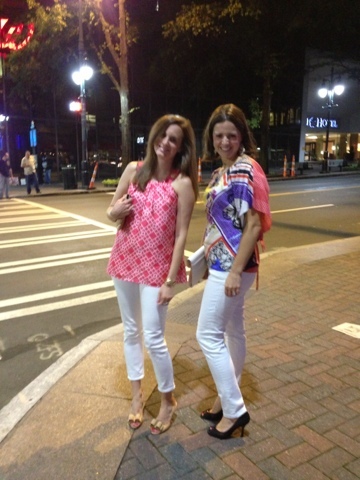 I'm pretty sure I need to come down to Charlotte so you can play tour guide and show me a fun time like this one! Wow, what a perfect weekend. Girls only weekend...love it! Everyone looks adorable, and certainly you all got lots of fun stuff packed into one weekend. Hearing you mention nails, makes me realize how bad I'm in need of a mani/pedi. :) Glad you enjoyed some gal time..it's always needed! Such a good tiiime! You totally rocked that jumpsuit! I've got a girlfriend in town this weekend, and we might just have to venture down to Bubble on Saturday night! SO many things to comment on here! haha. I remember riding the light rail three times a week to my internship from the parking garage in Pineville on South Blvd. allll the way to 7th street! I remember bundling up and almost falling asleep so times times! Okay, cut the reminiscing. Monkees is one of my favorite places EVER and I might need to take a trip there when I visit in Sept. (And to the Lilly store at South Park!) Those cinnamon rolls are to die for! looks like such a fun weekend with the girls!! What a fun weekend! Clearly you had a blast. I liked seeing your rosy cheeks in that last Lynx photo :) Thank you for sharing where you went, the next time I am in CLT I will need to check those hotspots out. 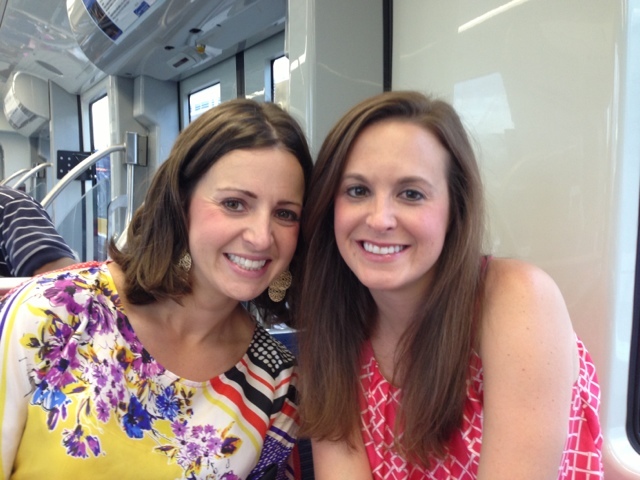 I LOVE time like this with my friends, especially getting dolled up together! That manicure place is SWANKY and I love your tassel clutch!